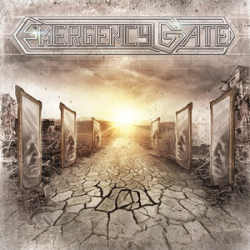 German metal band Emergency Gate has been around since 1996, and the simply titled You is already their fifth studio album. In the past I always lamented the band’s quality fluctuations they displayed throughout their history. In 2010 I believed that they finally made it to the right path with their album The Nemesis Construct, but three years later I am not so certain anymore. The new material is quite different from its predecessor. Of course one should applaud a band which is never standing still, but then one may also wonder that after fifteen years of existence, they still don’t seem to have found a final stylistic orientation. On their new record, the five musicians of Emergency Gate show themselves from a rather modern side. The twelve songs are kept rather short and are without an exception oscillating around the four minute border. Modern metal is the motto, and the keyboards have a more dominant role than in the past, and at times even sound put on. The vocals switch deftly between growls and clean parts, and while this is executed well enough, it’s certainly not a new idea. Some tracks are truly powerful and rock straightforward (Moshpit, Breathless), others are more groovy and modern (Back To The Grave). It’s not as if this latter material is bad, but a little more fine tuning and subtlety would have benefited the songwriting enormously. Despite the band’s contemporary outset, they seem to orient themselves by bands that were popular in the last decade. Two songs would have been better left off the album: Lean Of Words is a quiet track which feels too long, and Say Goodbye is definitely too cheesy for its own good. You turns out to be a little disappointing, considering how The Nemesis Construct became a higher rating. That album has been so far the band’s most powerful and brutal, and it’s sad that Emergency Gate had to try something new after this successful turn in their history. Collectors will have to look out for the limited edition with two bonus tracks and an additional DVD with video clips and live material.